Simply beautiful... and the cheese oozing out of the panini looks tempting. These look delicious. I can't believe I've never thought about making paninis in a griddle pan before! I make a lot of bread and really love paninis, will definitely be making these! Nic, those pictures are mercilessly teasing my taste buds, especially the second one! 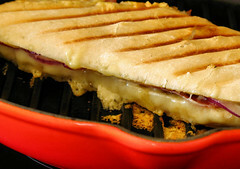 Grilled panini with cheese look sinfully good! Mmmm they look very edible!! I bought some dried yeast sachets the other day so this gives me a good excuse to make a mess of the kitchen this weekend and dust off the old panini press! Anudivya - thank you, I love melted cheese. Jules - the griddle pan is quite effective, do you have one? Sam - they are so quick and easy! Marysol - lol, another fan of melted deliciousness! Snooky Doodle - I try not to eat so much bread, but having teens in the house makes it hard. Yasmeen - thank you and welcome! Anne - lucky you to have a panini press! Hi Nic - I won it in a xmas raffle about 3 years ago! is great looking glass thingy http://www.amazon.co.uk/Russell-Hobbs-10810-Glass-Panini/dp/B0002VYJ9K but takes up to much room to keep out unfortunately :( ... but I think I will have to pull it out to make these as they look droolworthy! Love paninis, I will have to try them on the griddle as it makes such pretty lines. I have not had breakfast yet and all I can think about is this yummy cheesy panini!! The bread looks awesome! I'm definitely having a panini for lunch after seeing this! Looks great! That sandwich looks warm and delicious. 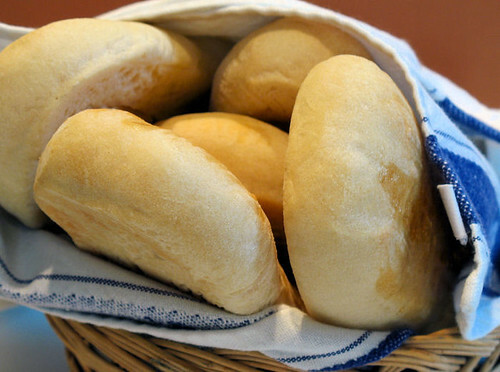 There is nothing like simple fresh homemade rolls to take sandwiches to a new level! Nic - I have a cast iron griddle pan. Weighs a ton, but cooks fab steaks! Beth - time to give them a go! Anne - how wonderful, it looks like a really good press. You'd better get it out and dust it off! Sheryl - thanks! Hope you have a good one too. Parker - that's the only reason for using the griddle pan, they still taste the same, but I agree the lines do look nice. Tartlette - I think we are going to have to do the blog rounds after lunch, all I can think about is macarons! Brilynn - what sort of filling do you like? I might have one with some blue cheese for my lunch. Lisa - I agree, you really can't beat homemade rolls. Grace - ha ha, isn't that funny - I'm sure I saw some panini buns in the store, they were kind of flat and long and I think they even had those little lines on already!!! Jules - mine is a cast iron one too, very heavy, but what a shame we don't eat beef in this house anymore. I used to love a decent steak! Lovely rolls, and such a delicious sandwich! I love panini sandwiches, especially when they ooze cheese like yours. I really should give this a go. Lovely panini Nic, bread is my weakness and I am always looking for new ones to try. These will be next. Fantastic...just couldn't wait for the picture to download! I don't have a press either & make mine the same way as you do. I'm gonna make these soon...very soon. Love the way they look! Delicious! Those panini rolls look good and so does that panini! Boy those look perfect and delicious. Nothing like fresh baked bread to make a great sandwich! Never actually seen a panini bread recipe. This is great.. I use 2 cast iron skillets to press my paninis. This looks out of this world - I'm not a bread baker but this I would try. holy smokes! that close up took my breath away...gorgeous bread..gorgeous panini!! 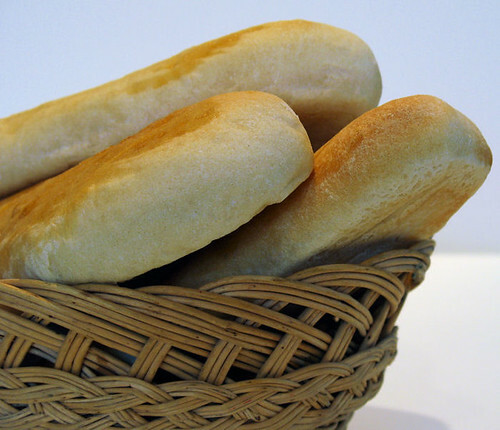 Wow, I call myself a bread lover and I didn't even know there was a World Bread Day! The panini rolls look brilliant, Nic. 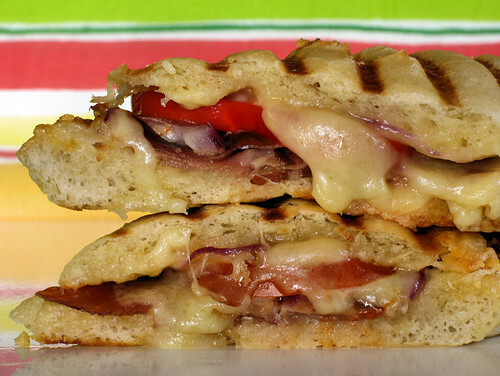 What a great idea to make paninis in a griddle pan. Thank you for the tip. They look fabulous. Your rolls look delicious Nic...I love the photo with oozing cheese!! Printed your recipe and I am going to try to make it, maybe with a twist. Thx for stopping by on my blog.. u always welcome there. Forgot to say I made these the other week but improvised and used stoneground wholemeal flour and made them by hand with a little help from the kenwood chef, didnt end up using as panini rolls but they made very good bread rolls! I have been on the search for a great homemade bread for panini's & Jules turned me on to this recipe. It was absolutely perfect! I had to use a bit more flour but they were so simple to make. Rico - hope they are good! Kristen - thanks so much for letting me know, glad they were a success!